Thanks to its wide open spaces and technological advances, the Arctic could see unmanned aircraft in regular commercial operations sooner than you think. 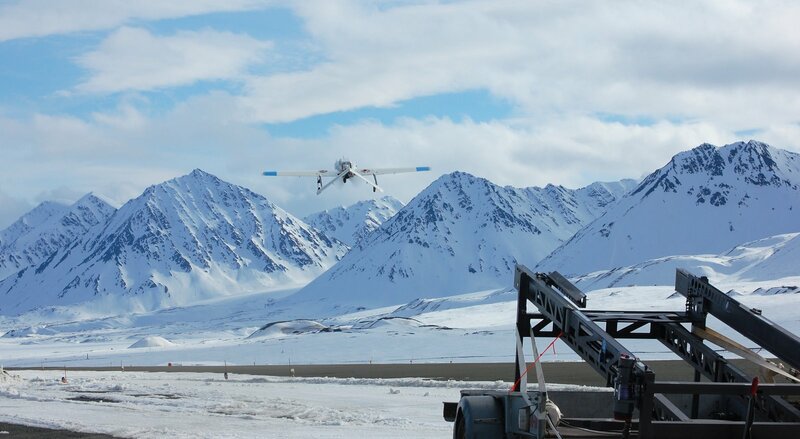 In three to five years, unmanned aircraft could be making routine commercial cargo flights in the Arctic, the early stages of a transportation revolution. That’s the vision of Cathy Cahill, who leads the Alaska Center for Unmanned Aircraft Systems Integration in Fairbanks, one of the major research programs for unmanned aircraft in the United States. The short-range flights could soon be a reliable way to deliver medical supplies and other necessities to villages socked in by bad weather that would keep manned aircraft grounded. Or to drop supplies to injured travelers stranded in the wilderness. “The technologies are getting closer and closer for us to be able to do the missions that are important here, the long-distance missions — doing the wildlife counts so we don’t have to put a biologist and a pilot in a plane and go fly through the mountains looking for sheep. We’ve all known friends who’ve died doing those kind of operations,” Cahill said. The wide-open spaces of the Arctic and vast distances are two of the major reasons why the region is likely to turn into a worldwide leader in unmanned aviation. She said she expects a “gold rush” as soon as the technology advances to the point of regular commercial operations. “We may be one of the first because we do have the largest expanses of unpopulated airspace,” she said. In the meantime, there is plenty to do to prove the safety and reliability of unmanned aircraft. The center headed by Cahill is like an experimental airline, with 32 aircraft now in its fleet, ranging from small planes similar to those run by hobbyists to the Sentry, which has a gross takeoff weight of about 200 kilograms (about 440 pounds) and a wingspan of 5 meters (about 16.5 feet). The Sentry can fly for up to 11.5 hours at 70 knots, or about 130 kph. The center acquired 10 Sentrys from the U.S. Naval Postgraduate School. The center has a staff of 18 with experience in engineering, aviation, mechanics and other specialties. The staff includes crewmembers qualified on about 30 manned and unmanned military aircraft, with more than 21,000 hours of flight time. “We’re doing a lot of testing with Transport Canada on how you operate in northern environments. Canada is letting us operate beyond visual line of sight. So we are getting data for them and feeding it back to the FAA,” Cahill said. Part of that effort in Canada involves her team operating unmanned planes on runways that are used by major aircraft. Last summer the Alaska team flew 4,800 kilometers over waterways in eastern Canada, looking for whales so that cargo ships could avoid them. “If you spot them in the waters you have to slow the shipping down,” Cahill said. She said the potential for unmanned flight in the Arctic covers many possible missions from “domain awareness” to oil spill response, search-and-rescue operations, marine mammal research, wildfire monitoring, and mapping ice. The latter category is likely to become a regular part of Arctic Ocean operations in helping icebreakers and other ships plot the easiest passage. As Russia’s Northern Sea Route becomes an increasingly important transportation corridor, for example, it will benefit from the heavy use of unmanned aircraft. The obvious advantage of unmanned aircraft is safety, Cahill said. “When the aircraft goes down all we’ve lost is the aircraft. That’s the safety case we’ve made to the FAA, we’re over unpopulated areas,” she said. Cahill, trained as an atmospheric scientist, has been working on unmanned aircraft for more than a decade. As the technology evolves, the main challenge is integration of unmanned machines safely into an environment in which they co-exist with manned aircraft. In the United States, the FAA has been slow to allow unmanned aircraft to go beyond visual line of sight operations. The Alaska center has received approval for flights of about 17 kilometers (about 10 miles) monitoring remote sections of the trans-Alaska pipeline in the Arctic. She said one test flight planned for this summer would be from Indian, a small community southeast of Anchorage, to Hope, a small community across Turnagain Arm. The unmanned aircraft will carry about a kilogram of Q-tips, simulating an emergency delivery of medical supplies with an aircraft that will be remotely operated for the 15-kilometer round-trip. With each step forward, the center hopes for expanded approval from the FAA for longer flights in which the planes are not within sight of the operator. One of her goals in the next few years is to see an unmanned aircraft fly from Nenana to Nome, simulating a medical supply delivery in honor of the famous 1925 serum run — an event that continues to be commemorated by the Iditarod Trail Sled Dog Race. Dermot Cole is at [email protected]. CLARIFICATION: This story has been updated so as not to overstate the connection between the Iditarod Trail Sled Dog Race and the 1925 serum run.